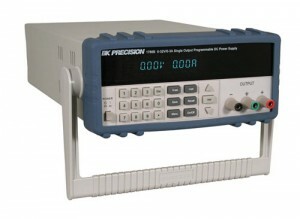 I recently acquired a BK Precision programmable power supply [External] BK Precision programmable power supply, type BK1786B. This is a DC power supply which can output voltages between 0 and 32 VDC, with an output current of up to 3 A. The supply unit is completely digital and programmable: you can enter the desired voltage/current configuration by entering the values on a numeric keypad. You can enter values with a resolution of 10 mV/10 mA so it is quite accurate. This kind of units is especially interesting for labo experiments, where you slowly need to increase the voltage between 0 and ... V. Of course there are so many other applications where you could use a programmable supply. The BK1786B comes with an RS-232 connection, meaning you can connect to it with a computer. It comes with some software you can use to view, change, log the outputs. You can also setup testing programs for hardware. Here you can view a list with software applications I developed for my BK unit. BKcomm class: this Visual Basic .NET class allows you to access your BK device very easy. The class has predefined functions to set/read the voltage/current. BKconsole application: this text-based console application allows you to enter commands very quickly. BK Shortcut detector: this application polls the BK every 100 ms to see if an overcurrent was detected. In this case a sound alert goes off. I have designed my own hardware add-on for my BK power supply. This hardware contains a PIC microcontroller that will communicate with the power supply. In the example code a LED is activated when the current limit is reached. View the complete project.